It is with great sadness that we announce that Professor Stephen Hawking has died on 14th March 2018 at the age of 76. Please find below the official obituary published by the University of Cambridge. In addition, former students of Professor Stephen Hawking in the Department of Applied Mathematics and Theoretical Physics offer the following brief personal preface. We mourn the passing of Stephen Hawking, one of the truly great figures of theoretical physics, whom we have had the special privilege of knowing personally over many years and working with as a mentor, colleague and friend. As a friend we have daily seen with our own eyes his unparalleled courage and his sheer determination in the face of grave disability. He was a living demonstration that there should be no boundary to human endeavour. As he said at the opening of the 2012 London Paralympics games: “There is no such thing as a standard run-of-the mill human being. And however difficult life may seem, there is always something you can do, and succeed at.” Stephen identified what he could do well, in fact, exceptionally well, and he invariably got on with his life and work with determination and good humour. Whenever not travelling, he was committed to being in his office in the department, where his “mind could voyage across strange seas of thought” or, more prosaically, he could prepare for his next major public engagement; with failing health in the last month of his life, he even struggled in for some seminars and to be again in his familiar office. Discussions there with Stephen were usually long and extended, due to his slowing communication rate, but they were invariably lightened with his irony, jokes and impish smile. The ability to see the lighter side of life and his perseverance in the face of adversity were important aspects of his warm and open personality. As a mentor, we had the opportunity to see Stephen’s work at first hand and we are deeply indebted for the example he set. He struck at the heart of a problem using his incisive physical intuition and, out of complex mathematics, he distilled the essential geometric concepts. Stephen’s novel insights across both relativity and cosmology were profound and influential. He was a physicist of the first class, drawn, in his close friend Kip Thorne’s words “from that small handful who repeatedly make the breakthroughs that shape research in their fields for many years”. His laser focus was always on tackling the really Big Questions about our Universe; those for which there are now answers because of his foundational contributions include: Did the Universe have a beginning in time? Are black holes unique? What happens when they collide? Do black holes live forever? Where do all the galaxies in the Universe come from? Fortunately, for us as colleagues, Stephen left some open questions, key enigmas on which he kept shining a bright light even into his last years. His information loss paradox for black holes remains a touchstone for fundamental theory, as does his ambitious no-boundary proposal for the origin of the Universe itself. Stephen often speculated about whether the end was in sight for theoretical physics and cosmology. In 2007, he founded the Centre for Theoretical Cosmology, in his own words, “to develop theories of the Universe that are both mathematically consistent and observationally testable.” With confirmation of his inflationary predictions in the cosmic microwave sky and the recent discovery of gravitational waves, the future looks bright for probing the detailed nature of black holes, even unveiling the earliest moments of creation. The profound legacy of Stephen’s original insights will certainly propel the field onwards. His life was characterised by unparalleled intellectual achievement and tremendous courage in the face of many challenges. We mourn his loss, but he will remain always a singular inspiration to us all. Professor Hawking came to Cambridge in 1962 as a PhD student, and rose to become the Lucasian Professor of Mathematics, a position once held by Isaac Newton, in 1979. In 2009, he retired from this position and was the Dennis Stanton Avery and Sally Tsui Wong-Avery Director of Research in the Department of Applied Mathematics and Theoretical Physics until his death. He was active scientifically and in the media until the end of his life. His ambition brought him a scholarship to University College Oxford to read Natural Science. There he studied physics and graduated with a first class honours degree. He then moved to Trinity Hall Cambridge and was supervised by Dennis Sciama at the Department of Applied Mathematics and Theoretical Physics for his PhD; his thesis was titled ‘Properties of Expanding Universes.’ In 2017, he made his PhD thesis freely available online via the University of Cambridge’s Open Access repository. There have been over a million attempts to download the thesis, demonstrating the enduring popularity of Hawking and his academic legacy. On completion of his PhD he became a research fellow at Gonville and Caius College where he remained a fellow for the rest of his life. During his early years at Cambridge, he was influenced by Roger Penrose and developed the singularity theorems which show that the Universe began with the Big Bang. To understand black holes and cosmology requires one to develop a theory of quantum gravity. Quantum gravity is an unfinished project which is attempting to unify general relativity, the theory of gravitation and of space and time with the ideas of quantum mechanics. Hawking’s work on black holes started a new chapter in this quest and most of his subsequent achievements centred on these ideas. 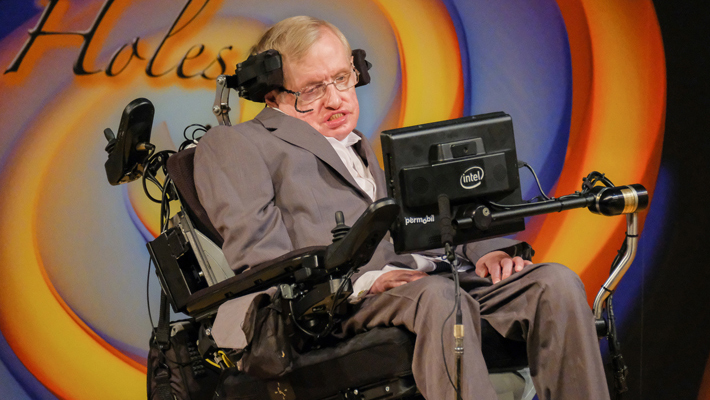 Hawking recognised that quantum mechanical effects in the very early universe might provide the primordial gravitational seeds around which galaxies and other large-scale structures could later form. This theory of inflationary fluctuations, developed along with others in the early 1980’s, is now supported by strong experimental evidence from the COBE, WMAP and Planck satellite observations of the cosmic microwave sky. Another influential idea was Hawking’s ‘no boundary’ proposal which resulted from the application of quantum mechanics to the entire universe. This idea allows one to explain the creation of the universe in a way that is compatible with laws of physics as we currently understand them. This text has been enhanced with photographs on the University's obituary page. Stephen's funeral took place at Great St Mary's Church in the centre of Cambridge on 31 March. About 500 guests attended and hundreds of people gathered outside the church to pay tribute. 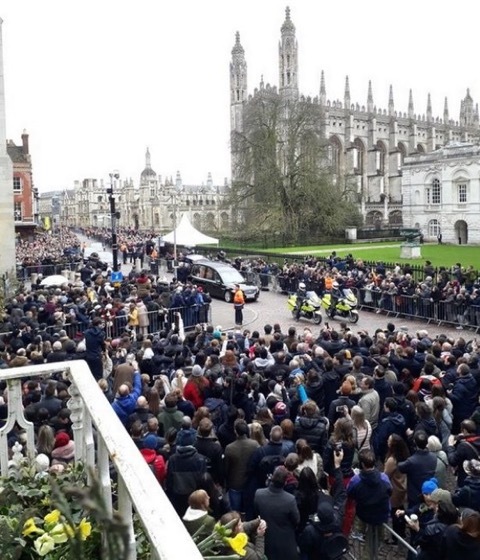 The funeral included a reading by the actor and Cambridge graduate Eddie Redmayne, who in 2015 won an Academy Award for his portrayal of Stephen in The Theory of Everything. Stephen's ashes will be interred at Westminster Abbey, next to the grave of Isaac Newton, in June, following a service of thanksgiving.